So real, you won’t miss the old, starchy noodles. Step back, Jack! Lasagna is noodly again. With the advent of pre-cooking cauliflower dough into sheets of noodles, this easy addition to your casserole will make life so much more decadent than you’d ever imagined. Shows approx. size of noodle dough in relation to casserole dish. Spray 2 rectangular cookie sheets with non-stick spray. Mix prepared, riced cauliflower with 4 cups of the mozzarella and the eggs in a bowl. Spread on cookie sheets in thin layers by plopping the dough about and then carefully pressing together (or apart). Keep fingers working until the dough forms a large rectangle roughly the size of the cookie sheet. Repeat with other sheet, pressing out until the dough is distributed. If it turns out you don’t have as much dough, press a longer, more narrow rectangle, roughly the length of the pan and half of the width, to keep noodle length uniform. Bake in oven for 15 minutes, or until top is golden and edges are lightly browned. Remove from heat and let rest for 10 minutes. Carefully run a metal spatula around the edges of the noodles to loosen and cool for 15-20 minutes. 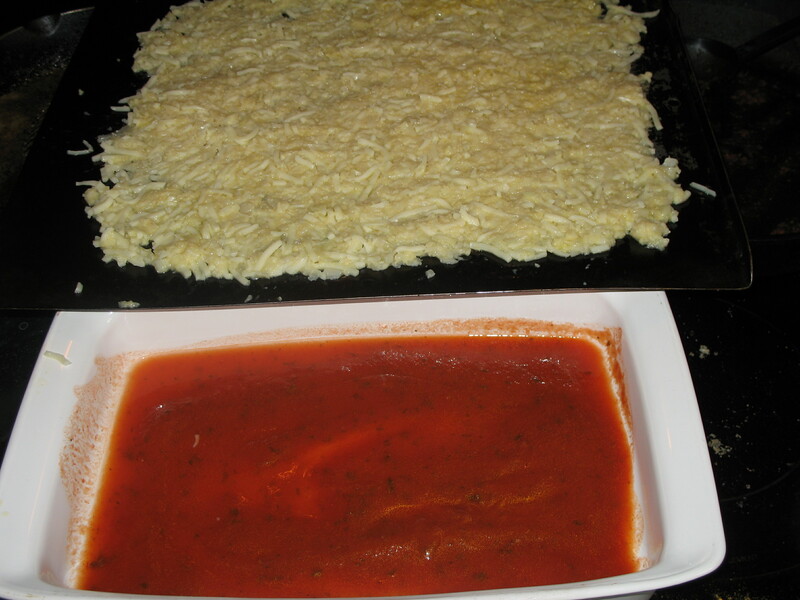 Using a pizza cutter or a knife, cut noodles lengthwise in fairly even strips about 2” wide. With a spatula, you will be able to lift and loosen noodles from the pan and handle them in your hands as you would regular lasagna noodles. Spray the inside of a casserole pan (9X13) with non-stick spray. 1. Layer the bottom with ¼ cup sauce. Add 2 Tbsp water. Distribute gently with a spoon. Do not add toppings yet. 2. Layer with 1/2 of the noodles. Press down very gently with fingers after distributing evenly. 4. Add 1/2 of the remaining sauce. With a spoon, spread and slightly mix the two layers (ricotta and sauce) for better coverage. 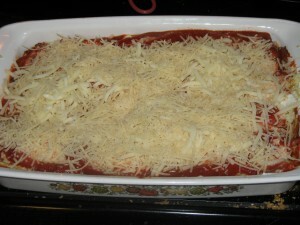 6.Layer with ½ of the mozzarella cheese (about 1 cup). 8. Add the rest of the sauce. 10. Add the rest of the ricotta and spread with a spoon with the red sauce. 11. Add the rest of the mozzarella cheese. Ready to bake like a sunbather in July. Bake in a 350 degree oven for 45 minutes, or until bubbly and the cheese is golden/brown. Let rest for 10 minutes before serving. 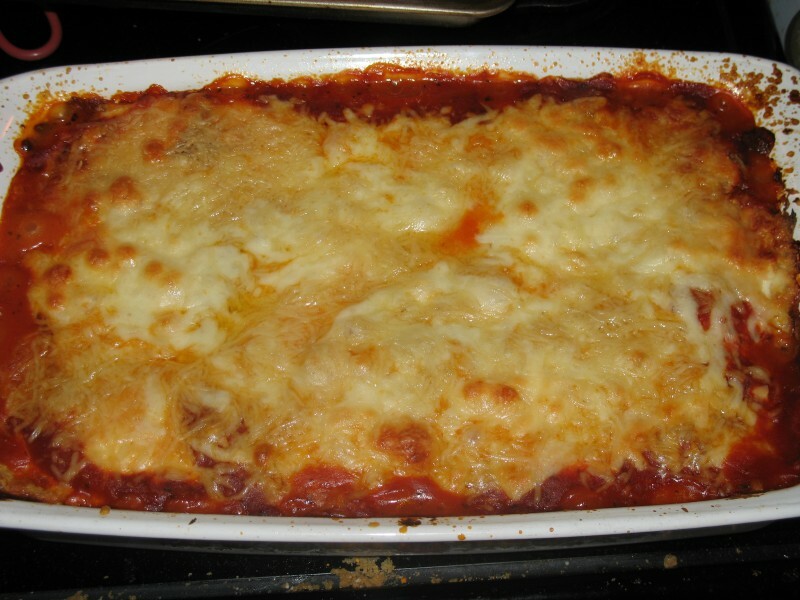 Lasagna can be stored in the refrigerator or frozen and reheated. 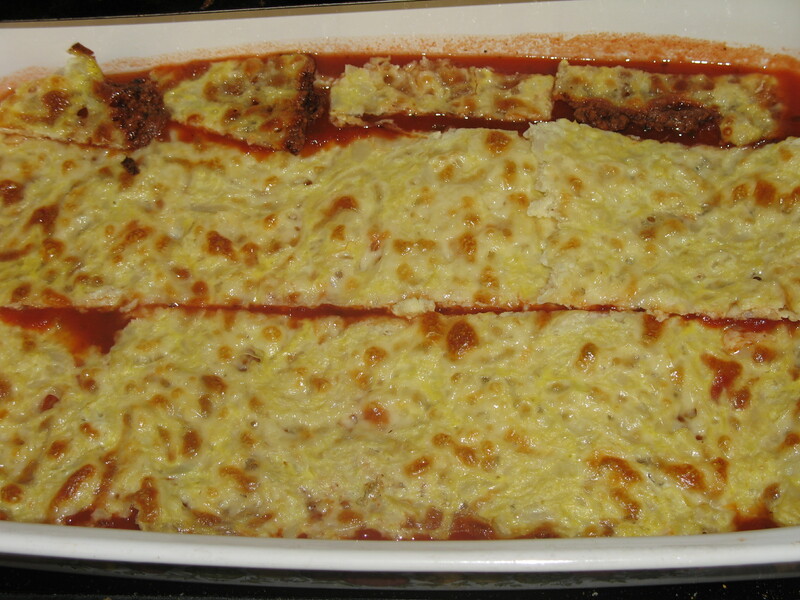 If you have leftover noodles and don’t want to form a third layer of lasagna, you can use noodles for roll-ups, make another smaller lasagna, or let noodles dry until crisp and make nacho chips from them. *If you have no ricotta, substitute ½ cup cottage cheese (4 ounces), mixed with 2 tsp parsley and ¼ cup Parmesan cheese (2 ounces). Picture: Toppings can be easy, colorful and fun. Want a quick and dirty lasagna recipe? Stay tuned. 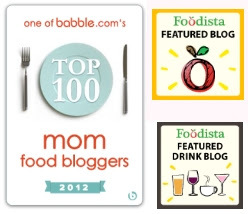 Subscribe to my blog and never miss a delicious beat. i am not a big fan of cauliflower .does this recipe taste like cauliflower ,or is the way u use it change the flavor? I make this and it does't taste at all of cauliflower. I think you'll be happily surprised by this lasagna. Also try the cauliflower pizza crust. Again, doesn't taste of cauliflower, and it's a good way of getting your veggie carbs in. Thamks for posting this recipe, I make it every week. This sounds YUMMY! I will try it! This would be great to serve for my "normal" guests. Wish I could see the pictures though. Could you fix that if you get a min? I can't wait to try this – I've just gone gluten free and I'm always looking for recipes as substitutes the things I crave. And mostly, right now, I'm craving pasta. Thank you! I’ve been wanting to try this recipe and your cauliflower pizza for some time now but do you have any suggestions for someone who is dairy and soy free? Flax and egg are binders, which is the role the cheese serves, so you might be able to make a crust that way. I think the only thing there is you might not be able to hold it in your hands. Still, an egg plus some flax (not a lot–) might be perfect! What do you think about making the noodles 1 day ahead? 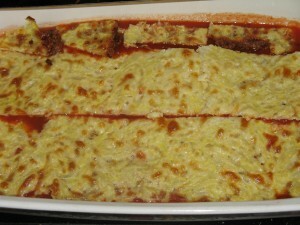 I want to make the noodles tomorrow (Monday), then layer & cook the lasagna Tuesday (for Bunco Guinea Pigs). Do you think that will work or should I just make it all on Monday and re-heat Tuesday. I’d say you can definitely assemble the dish a day ahead and then bake the day of! Dawn, not only could you make the noodles the day before, I’d say it might be absolutely compulsory! I started making this dish this morning (cooking and grating the cauliflower, mixing up the ‘dough’, then carefully spreading the mix onto cookie sheets, then baking, then ‘resting’ and slicing, and by now it’s the afternoon and I haven’t yet started the actual layering or baking. I can’t wait to see how this turns out for tonight’s dinner – but it IS quite labour-intensive if you’re planning to do a same-day meal. Whipping this up after work would be tough unless you have lots of help in the kitchen (or unless you don’t mind eating fashionably late in the evening! Thank GOODNESS I saw your post before I started to make my Lasagna. It was 7:30pm by the time I got home and this project wouldn’t work time-wise. I would have been knee deep into the cauliflower, and probably would have scrapped it. On another note … I made chicken piccata using Almond flour with AMAZING results! I made this last night with ground beef, fresh spinach, and yellow squash and it ROCKED!!!! Even my husband, who was very skeptical, thought “it was pretty good” 🙂 We have just this week started Atkins and I know that my husband and I can only take so many days of salad and roasted veggies with some sort of meat for dinner. So needless to say, I am VERY happy to have found your sight and look forward to trying many other recipes! Thank you! I am so glad, Stephanie! Thanks so much for taking the time to share how you made it and what you guys thought. Keep me posted on your progress, too. I am so excited for you guys! I’m so glad I found this website. 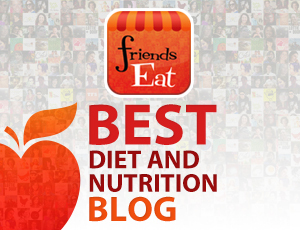 Like someone else mentioned, the traditional veggies and meat can get boring on the diet. I’ve only been on Atkins for a week and have lost 6 lbs and love my success so far and the recipes on here will definitely keep boredom at bay! Congratulations on your amazing success, brynisha! I am also glad to be able to help. I hope you give a lot of these recipes a try! I am currently working through all of them to nail down the Atkins induction favorites, and they are listed in the indexes of recipes in the main section of the pages as “IF” so definitely give them a shot! I think you’ll be pleased with them–and there are many. Sorry I’m on a cell. Is this induction friendly? I have checked all cans of tomato sauces in my cabinet and they have high fructose in them. How do you make your own tomato sauce? Could I just puree a tomato? Thanks I want to make this recipe tomorrow. I finally made this last night. I have been skeptical of any cauliflower because it’s not one of my favorite vegetables and I was also intimidated because I didn’t know how to “rice” it! But, out of desperation to stay on this diet and not cheat anymore, I googled how to rice the cauliflower and found it was quite easy by just shooting thru my processer, raw, then microwaving for 10 minutes. Easy-peasy! Making this is quite labor intensive, but, OMG….this was fabulous! 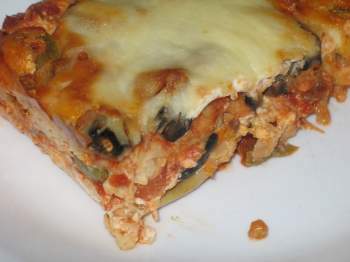 No cauliflower taste at all, and it’s like real lasagna! Since tomatoes are in abundance right now, I made my own chunky sauce with onions, garlic, tomatoes and spices so there was no sugar in the sauce, added some chopped black olives for toppings and a few hours (yes, a few hours) later, I had a most awesome tasting dish! It’s great to have something in the fridge that can be heated up when I’m too busy to cook. I love this recipe. Will definitely be making the cauliflower pizza now too. Thank you – thank you – thank you! Belenda, you’ve made my whole morning! Yay for giving it a try. I’m like you–not a fan of the cauliflower– so when it can be used for cool stuff it makes you feel like there are a whole new world of possibilities out there. 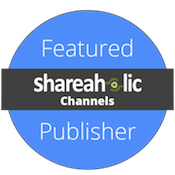 I am so pleased that you gave it a go, and even happier that you took the time to share your experience. Thanks so much! Would it be easier to bake the noodles on parchment paper like the cauliflower pizza crust?? It comes off the parchment paper so easy. But I don’t know if it will change the texture of the noodle. Does that mixture cook differently on the direct cookie sheet vice parchment paper?? And thank you for an awesome, encouraging site!!! Charlotte, I would say to use the parchment! It makes cleanup so much easier. Hi! 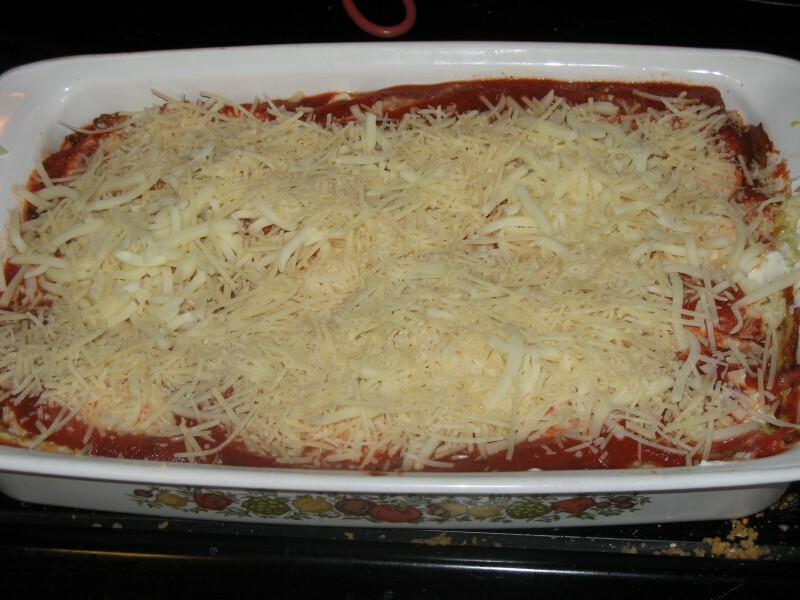 The cheese is meant to bind the ingredients together once it cools. I’m not sure that cottage cheese would give the same results, but you could try it and see. Never cooked with cauliflower, but did learn something… DON’T USE TIN FOIL!!! Had to start over lol. It’s REALLY GOOD though! I LOVE IT! Wanted to try it for my father-in-law who doesn’t eat cooked noodles. This is our favorite dinner! Thanks for the recipe! Some modifications I make, I don’t nuke the cauliflower, I blend it with water, drain off all the water I can, mix up the eggs cheese & some salt, then moosh it out flat onto a parchment paper lined cookie sheet. Takes about 15 extra minutes in the oven, but 1less step. It lifts right off the parchment paper & makes clean up a breeze! I’m WAYYYY late to this party but I am so excited to try this and MAYBE see if it passes my one son’s incredible scrutiny of any healthy lasagna I try to pass off on him!